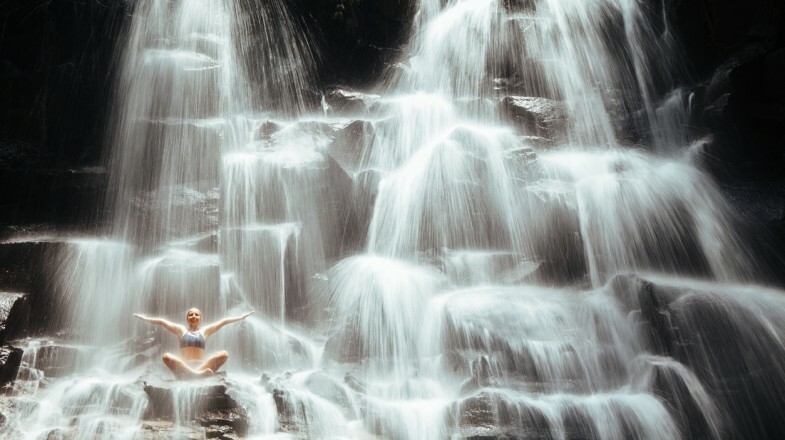 Enjoy a soak in the Kanto Lampo waterfall at Ubud, Bali. Indonesia contains some of the world's most spectacular waterfalls. Nearly each of the country's most popular islands has a waterfall worth visiting, and it can be hard to know which ones are worth your time! 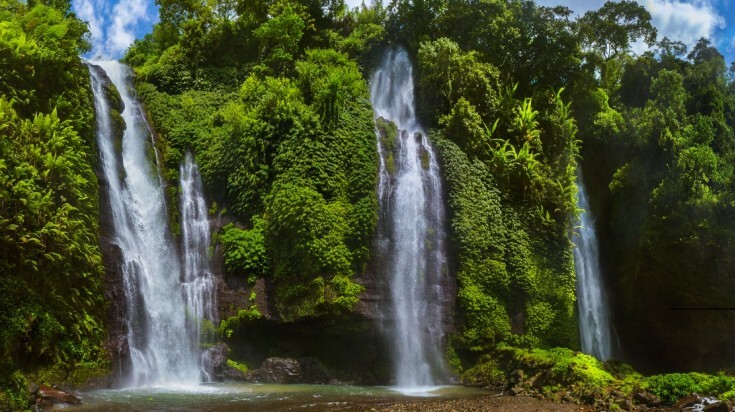 To make it a little easier for you, here is everything you need to know about visiting the 10 most beautiful Indonesia waterfalls. 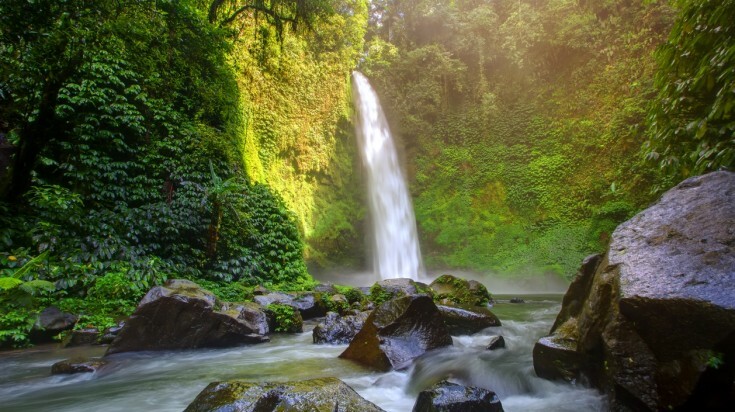 Bali has many gorgeous and popular waterfalls, and the majority of them can be found in the northern region of Buleleng. Kanto Lampo, however, is located in the Denpasar region, making it a little easier to access from the island's most popular towns. This waterfall is actually brand new because it was created in 2015 when a dam was built at the waterfall's hilt, making visiting Kanto Lampo one of the top things to do in Bali. HOW TO GET THERE: Kanto Lampo is located just next to Gianyar, a small town about 12 km from Ubud Palace. You can reach it in less than an hour's drive from Ubud or Denpasar. It is easy to reach the waterfall from the village, and the terrain is gentle enough for even novice hikers. Right next to the waterfall, on the left-hand side, is a set of stairs that you can follow down to the riverbank. The river here is full of eels and fish and you'll often find locals fishing there. As you leave the village and head towards the waterfall, keep your eyes peeled for a small bat cave. In case you are interested in hiking in Ubud then Mount Batur hike is an excellent choice. The giant Nungnung waterfall tumbles from a height of 900 meters. Nungnung is often called the most picturesque waterfall in Bali. Tumbling from a height of 900m and nestled deep in the Indonesian countryside, this waterfall is still somewhat undiscovered and is perfect if you want a peaceful, secluded experience. 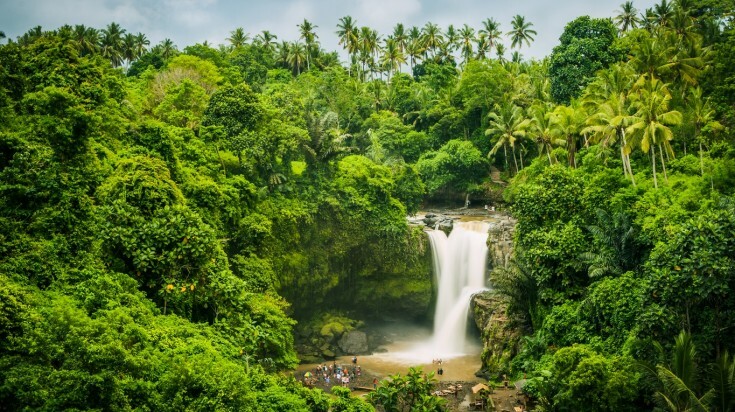 You will have to hike for about 35 km through the Balinese mountains to reach these falls! From the top of the falls, you then have to climb down 500 steps to reach the gorge at the bottom. HOW TO GET THERE: The Nungnung waterfall is located in Sangeh, about a 1.5-hour drive from Denpasar or just over an hour's drive from Ubud. TIP: The gorge at the bottom of Nungnung waterfall is perfect for swimming - just remember that you have to climb back up to the top! Visiting this waterfall makes for an easy and pleasant day trip. Tegenungan is by far the most popular waterfall in Ubud and most visitors to the area include it on their to-do list. If you've seen a photo of someone at a waterfall in Indonesia, chances are it is Tegenungan! Conveniently located, this waterfall is easily accessible via a short, well-marked path and makes for an easy day trip. HOW TO GET THERE: Tegenungan is less than a 30-minute drive from Ubud, or about 40 minutes from Denpasar. No matter which route you take, the drive to this waterfall is a pleasant one, passing small villages and lush rice terraces along the way. TIP: There are many shops and restaurants in the parking area for the falls, making this the perfect all-day trip. Be sure to visit Bebek Tamarind restaurant for some delicious fried duck. 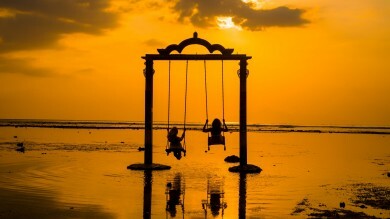 Check out this day-tour in Bali and dip into the cool waters of Tegenungang and Munduk among other waterfalls in Bali. Sendang Gile is the first waterfall you see before heading to the larger Tiu Kelep. 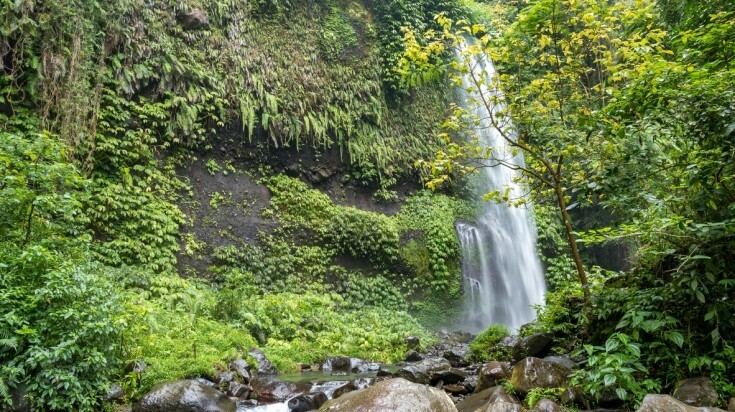 Tiu Kelep is hidden deeper in the forest and is the more powerful of the two waterfalls. When it comes to this waterfall, you actually get two for the price of one! Sendang Gile is a small waterfall that you can visit on your way to the larger Tiu Kelep waterfall. Sendang Gile is about 31m tall, is double-tiered, and only takes about 15 minutes to reach. Tiu Kelep is just another 45 minutes away and is far more powerful than its neighbour, tumbling 45m down a cliff. Note that while Sedang Gile is fairly easy to access, you'll likely want to hire a guide to help you as you make your way through the more difficult journey to Tiu Kelep. Bonus: It's not uncommon to come across monkeys on your walk to the falls! HOW TO GET THERE: These Indonesian waterfalls are not far from Rinjani National Park in North Lombok, within Senaru village. It will take you about 2.5 hours to drive from Mataram, the island's capital city. The drive itself is beautiful, travelling along coconut-tree-lined roads surrounded by lush mountains on one side and sprawling beaches on the other. TIP: Tiu Kelep is perfect for swimming - though the water is often very cold, so be sure to bring some towels to warm up afterwards. Did you know that Mount Rinjani is an active volcano and it can be hiked as well? Check out our guide on hiking Mount Rinjani for more information. Madakaripura waterfall is the biggest waterfall in Java. Local legend has it that Mahapatih Gajah Mada, the ancient ruler of the Majapahit Empire, once lived in this stunning waterfall. Madakaripura is actually a series of seven waterfalls, the biggest of which falls from an incredible height of 200m, making it the highest waterfall in East Java. Visiting Madakaripura is an incredible experience as the trail forces you to walk under some of the smaller waterfalls in order to see it in all its splendour. You might get wet, but trust us - it's worth it. HOW TO GET THERE: Madakaripura waterfall is located in Bromo Tengger Semeru National Park, one of the most popular parks in East Java. The main entrance to the park is in Cemoro Lawang village, about a 2.75-hour drive from the Surabaya International Airport. Once inside the park, it cannot be reached by public transportation, but the falls are often part of tours for the Bromo volcano, which is one of the active volcanos in Indonesia. ENTRANCE FEE*: 5,000 IDR per person (less than USD 0.50) - though note the nearest parking lot is 4km away, so you'll also have to budget for an ojek ride (about 10,000 IDR per person each way, or less than USD 1). 'Dua Warna' means 'The Waterfall of Two Colours' - and the name certainly doesn't disappoint. This spectacular waterfall has many shades of blue, white and grey thanks to the phosphorus and sulphur levels in the water. It will take you about two to three hours to hike to Dua Warna waterfall, but the sight waiting for you at the end is well worth the challenge! HOW TO GET THERE: The entrance can be found at the campsite in Sioblangit Camping Grounds, about a 2-3 hour drive from Medan in North Sumatra. You can park your car at the campsite and walk the two to three hours through the forest to the falls. Swim in the Dua Warna waterfall but be careful not to drink any of the water as it is full of unhealthy minerals. Bring a tent with you and spend a night camping alongside the waterfall. Moramo is an incredibly unique waterfall with a stream that flows across a 2 km-long plateau before dropping 100m down into a basin below. Surrounded by a vibrant jungle, these falls trickle down an incredible 127 levels! It's a sight that can hardly be captured by a camera - it can only be seen in person to be truly appreciated. Locals even say that angels once bathed here (yep, it's that beautiful). HOW TO GET THERE: Moramo waterfall is located within the Tanjung Peropa National Park in Sulawesi, about 45km or a 1.5-hour drive from Kendari. There is no public transportation offered in this area so a rental car is recommended - but be careful as the roads are not very well maintained. TIP: The lower levels aren't overly steep, so try sliding down them! The water isn't too powerful, so you won't get swept away. The path to reaching the Sekumpul waterfall is not easy but it still is a popular waterfall to visit in Bali. Like Tegenungan, Sekumpul is one of Bali's most popular waterfalls - and it's easy to see why. Though getting to the falls isn't necessarily easy - you have to make your way through jungle vines and down some slippery steps, not to mention a couple of river crossings - the view waiting for you at the end is like nothing you've ever seen before. HOW TO GET THERE: Sekumpul waterfall is just 2km from the village that gives it its name. It is about 18 km from Singaraja (40 minutes) or 27 km from Lovina (about 1 hour). Like most Indonesian waterfalls, there is no public transportation so you will have to rent or book a car. TIP: You will pass several other waterfalls on your way to Sekumpul, including Lemukih Waterfall and Gombong Waterfall. Spend a day at Sekumpul waterfalls on this private tour. Gitgit Waterfall is often called 'twin falls' or 'Air Terjun Kembar Gitgit' by the locals, due to it's being split into two equal streams. Gitgit is yet another popular waterfall in Bali thanks to its convenient location and easy access. Your path to the base of the waterfall is a well-maintained wooden boardwalk, so you don't even have to worry about getting your feet wet. 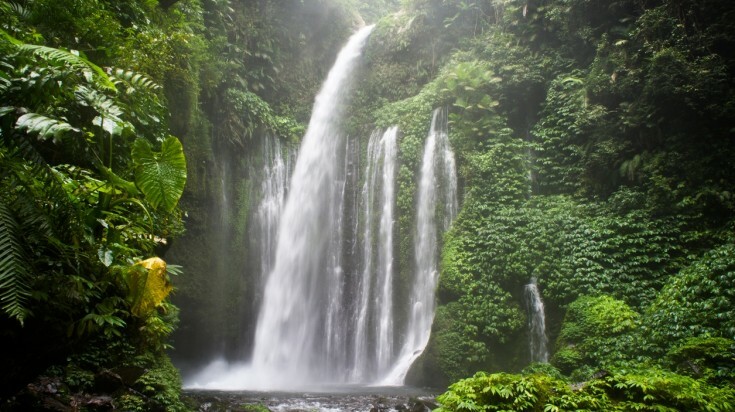 HOW TO GET THERE: Gitgit Waterfall is in the North of Bali, just 10 km south of Singaraja or 80 km north of Kuta. The roads accessing the falls are well maintained as this is a popular stopping point for travellers on their way to Lovina Beach. Take a swim in the rocky pool at the base of the falls. Continue on the guided path and you'll reach another waterfall called Mekalongan, which flows on the same watercourse. 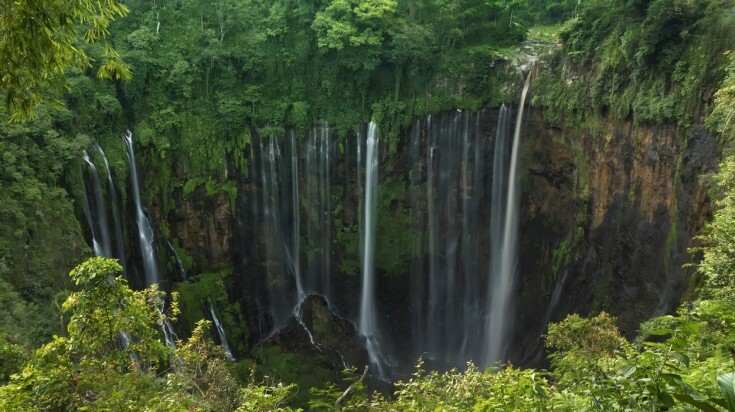 Coban Sewu translates to "thousand waterfalls" in the local dialect. Once a secret waterfall, Coban Sewu is becoming increasingly popular with tourists - even though the hike to access is it far from easy! The "thousand waterfalls" (as it is translated from the local dialect) is located in a deep ravine, accessible only by a thin path cut through the thick jungle surrounding it. It will take you about 20 minutes (and several ladders) to climb to its base in the canyon below, but it will be the most refreshing swim of your life. HOW TO GET THERE: Coban Sewu waterfall is just outside Sidorenggo village in the Lumajang Regency of East Java - about a two-hour drive from Malang. There should be a signpost just on the village's outskirts, which you follow for about 200m before reaching the car park. 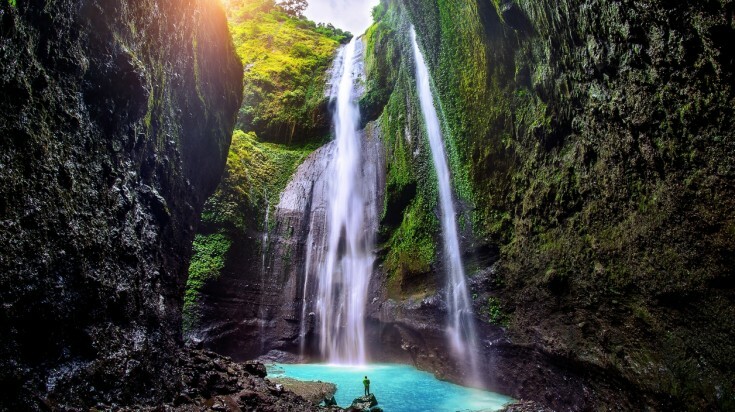 There are so many beautiful waterfalls to visit in Indonesia, spread across the country's many islands. From the tall and mighty to the simple and sweet, they perfectly represent Indonesia's great diversity. How many will you be able to visit?